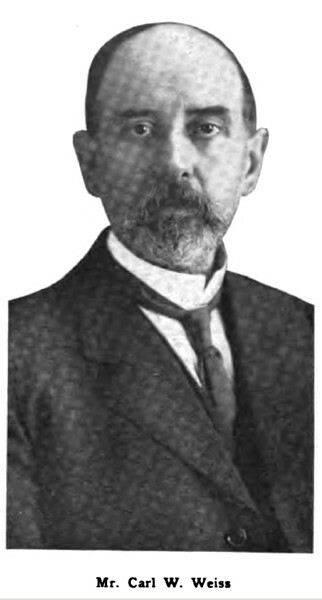 Carl W. Weiss-The Dean of oil engineers. » Carl W. Weiss-The Dean of oil engineers. [X] » Carl W. Weiss-The Dean of oil engineers. In 1894 the first practical surface ignition medium-compression two cycle oil engine was designed, built and patented my Carl W. Weiss, which is one of the principal reasons why Mr. Weiss is looked upon as the dean of oil engineers. Mr. Weiss has devoted his efforts almost entirely to the medium-compression surface-ignition two-cycle type of oil engine, which is so often termed semi-Diesel motor, but which term is absolutely incorrect and is rapidly being replaced by the term "Weiss Type." Mr. Weiss is a great believer in this type in preference to the true Diesel engine. Mr. Weiss was born in 1858 and educated in one of the finest technical schools in Holland. In 1876 he visited the Centennial Exposition in Philadelphia, Pa., and for the first time saw there the Otto Langen free piston type gas engine in operation. During several years following, Mr. Weiss was with the Benton Manufacturing Company in New York City, building experimental models of all descriptions. Among these models might be mentioned Edison's first talking machine, which was sent to the Paris Exposition. In the early 80's he perfected and manufactured a mechanical register and adding machine for the Check and Adding Machine Company of New York. During this time and several years following, he built a large number of caloric engines, both of the atmospheric and high-pressure type. The register business, including his patents and die casting method, having been sold to the National Cash Register Company of Dayton, Ohio, in 1889, he devoted his entire time to internal combustion engines. The first Weiss four-cycle type engine was built about this time and a number were sold in New York City, and several of them are said to be in operation today. In 1894 he completed his first two-cycle type engine, known as the Mietz & Weiss oil engine. In the small horsepowers there were sold in the first few years about 2000 engines. Most of these first engines are in regular service today. The increase in both domestic and export trade kept the factory busy for many years on small and medium sizes. There have been manufactured and sold about 300.000 horsepower of engines designed by Mr. Weiss and built directly under his supervision in the Mietz & Weiss plant, with which plant he was associated up to three years ago. Approximately three years ago Mr. Weiss severed his connections with the Mietz & Weiss organization and devoted himself to laboratory work, on which he has been concentrated up to the more recent past. The Weiss Engine Company, with which he became associated three years ago, is now producing the engine developed by Mr. Weiss. These engines incorporate all that Mr. Weiss has learned in thirty years' experience. Mr. Weiss is a member of the A. S. M. E. (American .Association for the Advancement of Science) and also the Legion of Honor of France, the Motorship League of America, and several other well known technical associations.